Chicago’s defense scored not one but two touchdowns and shut Carolina’s offense down, staking the Bears with an early lead that held up for the entire game. Even though the offense never really got anything going, this was the Bears’ easiest win in a long time. The Bears were up 14 points before the offense was really asked to do anything. That shifted an already conservative game plan even farther to the safe side, making them even more predictable. As a result, they went three and out with regularity, picking up only 153 yards and 5 first downs on the game. This forced the defense to spend too much time on the field and get tired; credit them for holding up under those conditions. Credit to the coaching staff for not sitting on a 14-3 lead with just over 3:00 left before halftime, like we all expected after watching their conservative approach this season. They came out and let Mitchell Trubisky throw deep to Tarik Cohen on 1st down, resulting in 70 yards and 1st and goal from the 5 yard line. They were unable to finish for the touchdown, but a field goal (plus a little rest for the defense) on that drive was key. Bears win! It’s been so long I’ve forgotten what that looked like. Hell, I had forgotten what it looked like for them to have a lead, as this was the first game that happened at any point since the first half of week 15 last year. Good teams find ways to win close games, and bad teams find ways to lose them. Despite trying their best to throw this one away with a litany of stupid plays, the Bears still found a way to win. Hopefully they can build off of this going forward. We’ll start with the good and focus on all three running backs, starting with a monster day by sophomore Jordan Howard, who looked like his rookie self for the first time this year. He ran hard, was decisive, and finished runs with power. Holes were there better than they’ve been so far this year, but credit Howard for playing better as well to take advantage of it. Howard did have a 3rd quarter fumble (though on replay it looked like he was down) that let the Steelers back in the game, and he had to leave the game twice with his injured shoulder in the 2nd half. Still, he came back and finished the game in OT, and finished with 138 rushing yards and 2 touchdowns. Just for good measure, Howard also led the Bears with 26 receiving yards. Tarik Cohen rebounded from a poor week 2 effort as well. He made a big play in the first half and a huge play in OT that jump-started the Bears’ offense and should have won the game (he was incorrectly ruled out of bounds, costing him a tochdown). His electricity showed up in limited touches (though 16 is still too many). 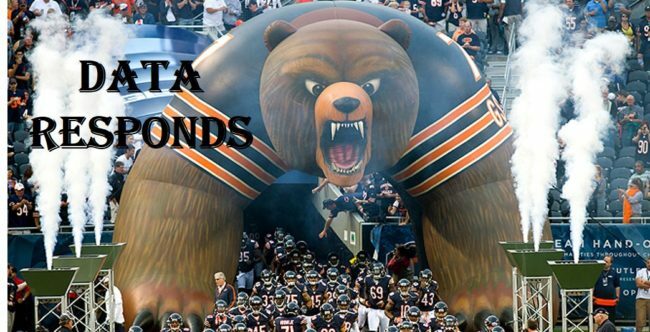 Perhaps equally important, the Bears finally started using him properly. His small size means that he can’t sustain as many touches as he’s been getting, so this week they started using fakes to him to open things up for others. They ran him around on a fake reverse several times, and this helped open up the running game for Howard. While we’re talking about running backs, Benny Cunningham was back from an ankle sprain today and made a few nice plays on 3rd down. Twice he caught checkdown passes way short of the sticks and turned them into a new set of downs for the Bears. Now for the quarterback, which is a lot less fun to talk about: it’s been 3 weeks and 3 bad games for Mike Glennon, who completed 5 passes (none of them to wide receivers) on 8 pass attempts for 31 yards in the first half. Despite this incompetence, the Bears still held a ten point halftime lead; just imagine how good this team could be if their quarterback wasn’t completely terrible. It stunts their entire offense, from the play calling to the run game. Well that was ugly. The Bears turned the ball over 4 times in the first half, trailed 10-0 after one quarter, and 26-0 at halftime en route to a 29-7 final score. I’m going to focus most of my comments on the first half, because that’s all that mattered. The 2nd half was just playing out the string. First, let me just start in general with the coaching. All three phases made huge mistakes in the first half as the entire team looked unprepared, and that is 100% on the coaches. They had key blown assignments, early wasted time outs, too many dumb penalties, and lots of sloppy turnovers. Somehow, Chicago’s coaches need to figure out how to get their team ready to play. Can whoever has a voodoo doll for the entire Bears team stop already? Nick Kwiatkoski, Kendall Wright, and Tom Compton all left in the first half, though at least Wright returned. In the 2nd half, Josh Sitton and Akiem Hicks added to the walking wounded, though Hicks also came back into the game. For those scoring at home, that means the Bears left week 2 without their top 4 WRs, 3 of their top 5 interior OL, and 2 of their top 3 ILBs, plus their top CB has yet to see the field this year. Mark this as the 3rd year in a row where injuries are a defining story of the season, meaning the Bears need to figure something out with their conditioning and training staffs. The coaches also continue to show zero feel for how to manage playing time in a blowout. You think they’d be better at it with all the practice they’ve gotten in the last few years. Somehow Akiem hicks and Josh Sitton were both playing so that they could get hurt in the 4th quarter down 4 scores, and the already overworked Tarik Cohen still saw touches in the 4th quarter as well. Zach Miller, who might be Chicago’s best healthy pass catcher and is made of glass, made multiple catches on the final drive despite having a rookie drafted in the 2nd round sitting behind him. Why? I’m starting at quarterback this week, because there’s nowhere else to start. Mike Glennon turned the ball over 3 times in Chicago’s first 3 possessions. He threw two terrible interceptions and showed zero pocket awareness on a fumble. By that point, the game was over at 23-0, and it was yet another terrible day for the former Buc. Glennon was far from the only bad Bear in this game, but he was the worst. His time as Chicago’s starting QB has already gone 2 games longer than it should have, and now it officially needs to be over. Yet with this pathetic coaching staff, I don’t doubt that Glennon will be starting next week, especially after showing “promise” in a meaningless 4th quarter (where he missed several throws and had another INT dropped by not one but two defenders). Glennon was inexplicably not benched at any point during this game, and finished the day 31/45 for 301 yards, for a poor 6.7 yards per attempt. But that doesn’t accurately reflect just how bad he was, even on the non-turnover plays. He hit a bunch of throws underneath that any NFL QB should be able to make, and also forced several incompletions on short passes that went to his targets’ feet and/or behind them. We know what Glennon is, and it’s not good. There’s absolutely nothing he does at an above average level, but many things he’s quite bad at. Tampa Bay came into the game focusing on stopping the run and keying in on Tarik Cohen in the passing game. This should have been predictable to Chicago in their game preparation, as those were basically the only things that worked last week, but they couldn’t come up with anything else effective. The 1st half yielded 16 rushing yards (on 14 attempts), 3 offensive turnovers, and 0 points. The passing game actually got some work going underneath in the passing game, but that approach requires long sustained drives without a mistake, which they are not capable of doing. Speaking of Cohen, he came back down to Earth a good bit in week 2. Tampa Bay unsurprisingly focused on him after his big debut last week, and successfully shut him down. He also had an incredibly stupid punt return where he picked up a ball off the bounce when surrounded by Bucs, was immediately hit, and unsurprisingly fumbled. The coaches needed to anticipate Tampa Bay’s defense would key on Cohen and use him as a decoy in this game. They failed to do that, which led to the offense being too predictable. Those edge runs that Cohen was able to turn into gains in week one were all snuffed out and contained this week. Their touches for Cohen became too predictable, and he continued to get too many (17, when the goal should be 10-12 for a player of his size, like Darren Sproles consistently gets). Kendall Wright was featured more today after being completely ignored until the 4th quarter last week. I’m surprised it took that long for Chicago to realize they should try involving their best WR in the game. In all the OL shuffling as Compton and then Sitton got hurt, 2nd year man Cody Whitehair moved from C to LG to RG. Continually moving one of your best players around seems like a poor strategy to me. Let him get comfortable and dominate at one spot. Another week, another opening scoring drive by Chicago’s opponent. As Andrew Dannehy has been all over, this is a worrying trend for the defense, and one that leads to them losing games. 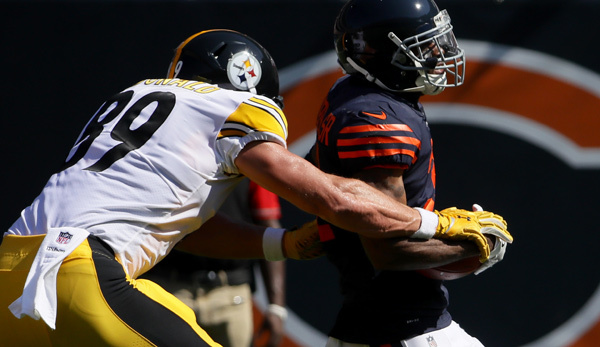 Somehow, the Bears need to figure out how to stop putting themselves in a hole at the start of nearly every game. Two other bad trends for the Bears showed up repeatedly in this game as well: the inability to force turnovers and the inability to get off the field on 3rd down. In the 1st half, Tampa Bay was 4/7 on 3rd down, including 3 3rd down stops negated by penalties. Perhaps more worrying, the Bears failed to force a turnover until after the game was out of reach. They even had a great chance on the 2nd play from scrimmage, when Danny Trevathan tipped a ball up in the air that hung forever. Somebody needs to come up with an interception there, but no defender got even close. Pernell McPhee (it was good to see him for more than 4 snaps this week) finally forced a fumble in the 3rd quarter, which Leonard Floyd picked up. Speaking of Leonard Floyd, the Bears need much more from him. Chicago’s supposed budding superstar has been mostly invisible through the 1st two games, though he finally showed up with a few plays in the 2nd half (after the game was over). They need him to be a difference maker. When that didn’t happen in the first half, the defense got zero pass rush and looked pretty mediocre. Pretty much the only positive from the first half in my book was Kyle Fuller. Tampa Bay’s passing game moved the ball well, but everything went towards Marcus Cooper. By my count, Winston was 0/4 targeting Fuller in the 1st half. Of course, Fuller did drop an easy INT in the end zone in the 4th quarter, so it wasn’t all good. Rookie safety Eddie Jackson had a solid game too. He put in good work in coverage (largely on Fuller’s side, where Winston had much less success) and plenty of sure tackling, including a nice tackle for loss in the run game. That’s all I have from this nightmare. I feel like I put in more effort than the Bears today. Seriously, we’re two weeks into the season and this team already looks lifeless. They didn’t even get excited after finally forcing a turnover in the 3rd quarter. It feels like the players have prepared themselves for another long, losing season. Can you blame them?